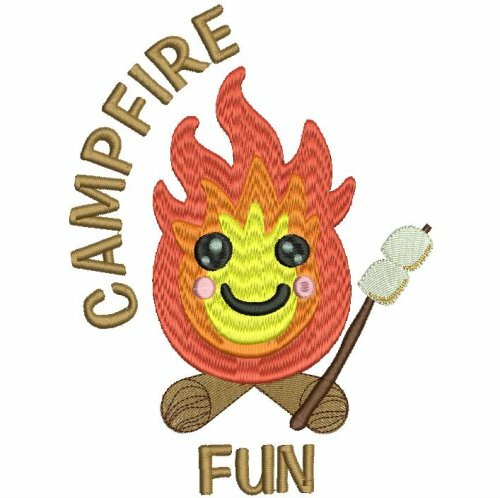 Campfire Fun - 3 Sizes - $4.99 : Fancy Fonts Embroidery, Home of the ORIGINAL Trendy Dots Font! Inspired by art drawn by my 13 year old daughter, Holly, who is an amazing, talented artist! While trying to think of ways to raise money for art supplies (since she is too young for a job), I offered to digitize her art drawn exclusively for Fancy Fonts Embroidery. 100% of the profits from all sales of Holly's work will go directly towards her art supplies fund. This exclusive design comes in sizes for the 4x4 and 5x7 hoop. *Note: If you need the ART format all you need to do is convert the DST to ART using your Bernina software. This product was added to our catalog on Friday 11 April, 2014.